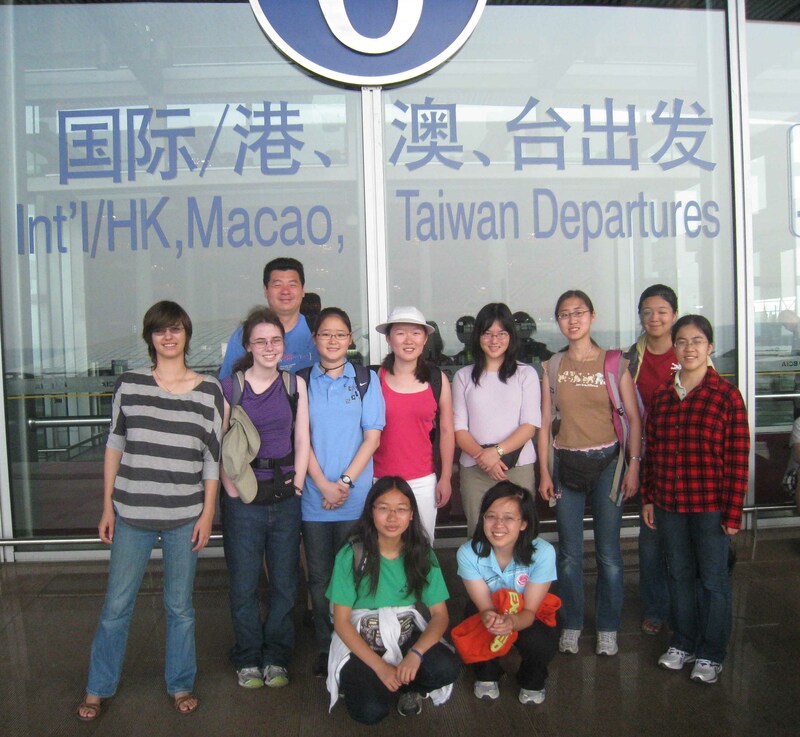 For the fourth year in a row MSRI will be sending eight of the brightest young women in mathematics to participate in the 2010 China Girls Mathematical Olympiad. The competition was originally established as a regional competition for teams of female high school students from China and other eastern Asian countries (including Russia). Several years ago China expanded the competition to countries from around the world, with the USA, Canada, South Africa, and Australia among the invitees. The team will spend three weeks preparing for the competition at the Mathematical Olympiad Summer Program offered by the Mathematical Association of America on the campus of the University of Nebraska at Lincoln. The Olympiad will be held from August 9-13 in Shijiazhuang, the capital of Hebei Province, about 100 miles southwest of Beijing. They will spend a few days in Hong Kong on the way to the competition while they adjust to the time change and a few days in Beijing on the way home. We are grateful to our generous partners in this project whose financial support has made the trip possible: IBM Research - Almaden, Akamai Foundation, Mathematical Association of America, Sunlin and Priscilla Chou Foundation and Science Workshop. The members of the USA team are, Joy Zheng, Elizabeth Synge, Cynthia Day, Jing Jing Li, Jae Eui Shin, Lynelle Ye, Andi Wang, and Adisa Kruayatidee. 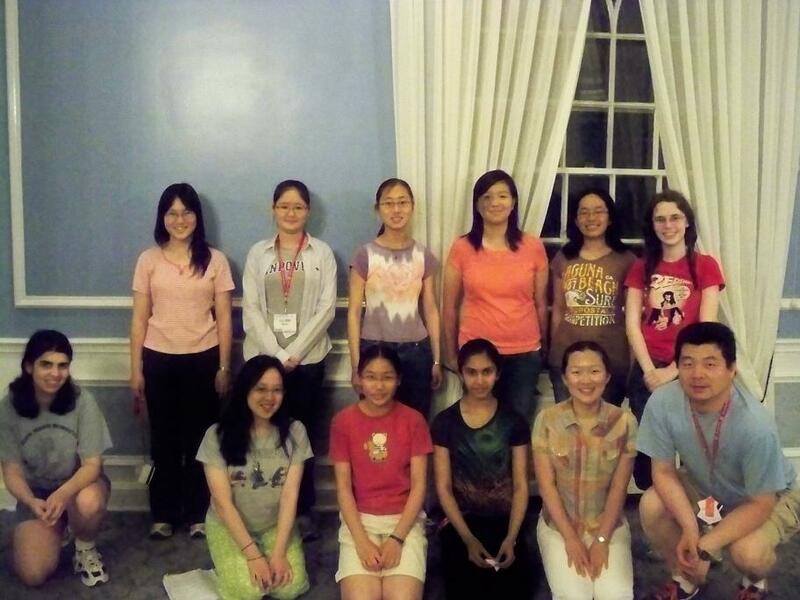 The team coach is Zuming Feng, leader of the USA International Mathematical Olympiad (IMO) team and Director of the Mathematical Olympiad Summer Program (MOSP) since 2003. He is a teacher at Phillips Exeter. Assistant Coaches are Inna Zakharevich, was in the top 12 at the 2002 USAMO and is currently a graduate student at MIT, and Sherry Gong, a member of the 2007 USA IMO and 2007 GMO teams and currently at Harvard. We are extraordinarily proud of all the girls for doing such a wonderful job representing the USA both at the competition and in their travels in China. As you can see from their reports below this was an experience they will always remember. For some this was their last year of eligibility and they will go on to college. Others hope to compete again next year as members of the 2011 team. We look forward to watching their progress as they move toward careers in mathematics. Visiting the Great Wall in China, the US team members and coaches are shown, left to right: front row, Adisa Kruayatidee (from Stevenson Ranch, CA), Cynthia Day (San Jose, CA), Jae Eui Shin (Andover, MA), Inna Zakharevich (assistant coach, attends MIT); back row, Sherry Gong (assistant coach, attends Harvard), Zuming Feng (team coach and a math teacher from Phillips Exeter Academy), Shijie Joy Zheng (Bellevue, WA), Lynnelle Ye (Palo Alto), Andi Wang (Stoneham, MA), and Shiyu "Jing-Jing" Li (Sunnyvale, CA). The US team members and coaches are shown before their departure from Hong Kong headed back to the United States, from left to right: front row (sitting), Cynthia Day (from San Jose, CA) and Adisa Kruayatidee (Stevenson Ranch, CA); second row, Inna Zakharevich (assistant coach, attends MIT), Elizabeth Synge (Lexington, MA), Jae Eui Shin (Andover, MA), Andi Wang (Stoneham, MA), Lynnelle Ye (Palo Alto), Shiyu "Jing-Jing" Li (Sunnyvale, CA), Sherry Gong (assistant coach, attends Harvard); back row, Zuming Feng (team coach and a math teacher at Phillips Exeter Academy) and Shijie Joy Zheng (from Bellevue, WA). Local news video of CGMO 2008. August 16, 2010 We're leaving for home tomorrow. Although some parts of trip dragged on (like the steps leading up to the Great Wall of China), it feels much too soon to be saying good-bye. And although there are some things we never got to do (like make S'mores), it's ok because we've made so many good memories together: playing at Ocean Park, watching the ridiculous movie on the flight to China, discussing problems after the test, cheering at the awards ceremony, touring Beijing, and more. This trip let me form much stronger bonds with the other girls. In fact, I've now roomed with every single one of the CGMO girls at some point or other! I'm sure that we'll all stay in contact, and I'm looking forward to meeting the other girls again (which I'm sure will happen!). I guess what to do now is value the time we have left together!!! For our second day in Beijing, we decided to go shopping. At ten in the morning we left for the Suzhoujie subway station and rode line 10 to Guomao station. Then we walked approximately ten minutes to the actually market. We passed by China's World Trade Center and several high buildings that caught our attention. The market had seven floors - one through four sold various objects and the fifth floor was designated for expensive pearl shopping and sixth and seventh had restaurants. We split in to several groups and in particular I shopped with Jing Jing. First we explored the first floor which was full of clothes. Because Jing Jing and I were more interested in the toy section on the second floor we proceeded to walk up the stairs to the second floor. The second floor was amazing! I bought a remote controlled helicopter and a small hedgehog Ty beanie baby and Jing Jing bought a dragon. I think Jing Jing and I bargained pretty well because we could both speak enough Chinese for it. On the same floor I bought a leather jacket and that is were I lost Jing Jing because Jing Jing ran away when the merchant insisted she buy one too. While shopping I ran into another group consisting of Joy, Cynthia and Lynnelle who were buying ice-cream. On the fourth floor where they sold jewelery I reunited with Jing Jing and went to eat lunch at an Irish Sandwich place. I ordered a chicken and bacon sandwich and Jing Jing ordered a salad. This one waiter kept on asking me what university I was from and asked whether I was from Beijing University or Qing Hua University. Later when all of us congregated at 2:00, our "together time", we decided we would have our "together time" again at 3:30 so we can do some more shopping. I bought a pair of gold pajama pants and an awesome Spain soccer jersey from the 2010 World cup which I think was my best buy of all. Near the end I got uninterested in shopping for more stuff because some merchants were being way too insistent and impolite. When we arrived back at our apartments we showed each other what we bought and I tried out my helicopter after successful gathering six AA batteries. I realized I will have to do some practice on flying the helicopter. After dinner we wanted to go to Karaoke but we couldn't because Karaoke was not allowed that day for people were mourning for a natural disaster that has occurred recently. Today was a pretty awesome day and I was very pleased with all the items I bought! August 16, 2010 Somehow, we've made it to the end of another year at CGMO. We spent today at the Great Wall, where we climbed up to the top and then wandered around for a while before taking a picture and toboganning down. I originally thought that the toboganning would be like a roller coaster (and I'm not a particular fan of roller coasters) but it turned out that we could control our own speeds, so it was pretty cool. Then, this evening, we went to a restaurant where they cooked your food right in front of you on a grill-like thing. I found it really interesting just to watch them cook, especially when they lit the beef on fire right on the grill. It was pretty hilarious--every once in a while, there would be a spurt of flame from somewhere in the restaurant. Overall, this has been a great year of CGMO. I really enjoyed the trip to Hong Kong/China (we avoided the 9-mile hike!) and did reasonably well at the competition, although it would have been nice to have done a bit better. Also, I'm coming back home with new friends, a lot of good memories, and a pair of really awesome spherical pandas (they're so cute and hugable!). Thank you to everyone--coaches, students, sponsors, volunteers--who made this experience what it was! August 16, 2010 So tonight we went to a really awesome restaurant. We were seated at semicircular tables which except for our place settings were mostly stovetop, and we had one cook who stood there for two hours and cooked each of our dishes one after the other in front of us. Highlights: -The fruit juice lottery--rather than us ordering drinks, they brought various fruit juices to us at random and when I finished the first glass (cantaloupe) they replaced it with another random one (mango). Watermelon, papaya, and papaya-with-strawberry were also in the mix. Later some people asked for coconut and got it. -The leaves--when Joy tried to ask for coconut juice (pinyin = ye1 zhi1), the waitress thought she was asking for leaves (ye4 zi1). The good part: she proceeded to actually bring a small plate of fresh green leaves (after which the confusion was sorted out and the coconut juice delivered). -The fire. Just...the fire. (Hopefully Joy will be more detailed.) -The fact that because I was sitting at one edge of the table, the cook served me first every single time. -The food--all of it. Every single thing they gave us tasted good, even the ones I almost always dislike. I mean, I hate shellfish, but they made scallop tasty. It was confusing. So, amazing end to an amazing trip. It's insane how many new things I've tried and how awesome my teammates are. I can't put into words how memorable this was, so I won't try. To everyone who helped to make our journey through China possible--thank you, and I hope next year's team will have as much fun as we did. August 15, 2010 After the day one test was over, we started chanting "four problems tomorrow, four problems tomorrow" to each other and continued doing so in a rather obsessive manner during the long wait for the second half of the contest to begin. In a way, this worsened the psychological stresses of the contest for me. Day one had been "no idea what'll happen, anything's possible, go in and go with it" (no, being a veteran doesn't preclude this mentality). Day two, on the other hand, had an air of "get it right *this time*, or else" to it. Unfortunately the test seemed designed to mesh badly with my state of mind--it consisted of two relatively short problems which were not really satisfying to solve and two harder ones I absolutely could not get my head around. When it was over, I was, well, glad it was over. Then I ate some ice cream, started on a recently-purchased novel, did some origami, watched the aerobics competition, and at various points during all of these things complained a great deal. All of which was very nice and made the day an overall success despite the aforementioned nasty test. As Cynthia would put it...yay! When we woke up in the morning we were all excited to wear our blue polo CGMO USA shirts for the closing ceremony. From last night we already knew our medals so we weren't nervous but just happy. At the ceremony they gave out the bronze medals first then the silver and lastly the golds. Each time ten students would go on stage and receive their medals and certificates. I was really alarmed when my name was the first to be called among the U.S. team because I had estimated my score to be 78 rather than 87. When the gold medal was hung around my neck I felt truly fantastic and lucky. I was really glad with how well I did on my first international compeition. After the ceremony all of us went back to our dorms and discussed the eight problems that were on the test while our leaders Inna and Sherry video-taped us. Looking back on those problems, we all thought we could have done even better but its okay because our team did awesome and won 2nd place overall. Saying our goodbyes to our beloved volunteers and other team contestants was very emotional. We had seven volunteers overall and they were all very warm and friendly to us. They gave us multiple presents and we gave them origami polyhedrons which we made. Once we exchanged our email addresses I felt less sad because we could at least contact each other. For our 12:30 bus ride to the train station we began walking toward the two huge buses but when we were just a few feet away from the buses, the buses started departing and therefore we realized we missed our ride. A little later the Russian team showed up and we realized we weren't the only ones who missed the bus. In the end we took a public bus and then a taxi to the train station. The train ride to Beijing was about two hours during which Joy, Lynnelle and I discussed the alternate solutions to the two geometry CGMO problems. After arriving at our apartments in Beijing we went out to eat Beijing roasted duck which was really delicious. I look forward to the next few days of touring Beijing! August 10, 2010 Today was Day 1 of the test! Fortunately, I did all right, despite the fact that I spent the previous few days worrying about getting a NEGATIVE ZERO. The first problem looked intimidating because of the notation, but it actually wasn't that bad. #2 made me (all of us, for that matter) very sad. The problem statements had things like right angles and midpoints, making it look very approachable, but we each spent several hours on it to no avail. We later learned that the solution involved a ghost point, which none of us thought of trying. The third problem was number theory; several of us solved it in completely different ways so it was a good learning experience! #4 was a very frightening inequality, but the solution was very nice. I solved two full problems today, as did many other people on the team. Some people were disappointed on their performance, but I think that what matters is not how you do, but the work you did leading up to today, whether or not you tried your best, and all those other cliches (because they're very true!). Anyways, we should just focus on getting into a good mindset for tomorrow, because we're clearly all going to solve FOUR PROBLEMS! Fitness Room and Pool: "When I let go of who I am, I become who I may be. "-Lao Tzu. (If I use the pool for two days, will I lose all the fat I gained from sitting on the plane for 785289503290679 hours?) I've learned that a better workout is playing pool. It really works those deltoids, especially if you're 1) playing by yourself, 2) you want to get every ball in, 3) it takes an average of 16.7 hits to score half a ball. Hi Mom and Dad! Look, I'm on the web! Also, I highly object to this "blog" term. I believe we need a more profound name, perhaps "chronicles." I'm going to make this short because we're headed to Victoria Peak today. I want to go now now now now NOW. Maybe if we head out early enough Sherry will let me hike up to the top...? *See my opinion on the word "blog" a few lines up. August 7, 2010 So, the past 2 days have been really exciting. On Thursday, we went to Ocean Park (which was slightly disappointing as many of the rides were closed and most of the lines were too long) as well as had a hot pot dinner with the Science Workshop. Yesterday we went to the Ladies' Market. I didn't really buy as much as some of the other girls, but it was fun just browsing around. The prices seem to be more expensive and the merchants more rude than I remembered them to be. After the Ladies' Market, the Science Workshop people took us to this really posh place, the American Club, and Adisa, Jae, Andi and I went swimming in their pool. (It's not as cool as the one at our hotel, but it's still pretty big.) There was a lot of exotic food at their dinner, and I tried mangosteens and this other pear-shaped fruit that tasted slightly like a green apple. We even got to see their Chill Lounge (a game room) and play in there. We're leaving today for Shenzhen by ferry, and soon after, for Shijiazhuang and the competition! August 6, 2010 August 6 2010 Today afternoon we went to the Ladies' Market, which is basically a very long street with stalls set up on either side. It carries a lot of cute, interesting products that are hard to find in the US. For example, Joy got a pair of Yoshi slippers, Jing Jing bought a special Rubik's cube, and I got adorable handheld fans that will probably come in handy a lot! Because I brought extra money from home, and figured I might as well spend it all, I kind of bought too much. Hopefully my suitcase won't explode! The only downside to the Ladies' Market is that they make a living off of ripping off foreigners (like us). Since haggling makes me feel very sad, I'm pretty sure I paid several times the regular price for some of the items. Oops! But overall, it was really fun, and after all, letting yourself be ripped off helps the economy. August 5-7, 2010 So I've spent the past two mornings teaching math to kids in the 8-12 range at a science workshop run by one of our sponsors, and I'm going again today. I definitely did not expect to end up doing this instead of touring Hong Kong with my teammates, but it's been an immensely awesome experience. It helps that I already saw the places they're going during CGMO 2008, and that because of the heat and humidity I feel highly inclined to stay inside, but mostly working with the kids is just really fun in and of itself. I love teaching people of any age and mathematical experience, and in particular I hadn't worked with kids this age for over a year, so experiencing the way they think and their general cuteness is quite refreshing. I feel extremely lucky to have gotten the chance to meet these kids. If we do nothing else the entire trip, this opportunity has already made the whole thing worthwhile. August 5, 2010 Yesterday, we went to Ocean Park for most of the day. It was awesome! We got to see a lot of animals, including giant pandas, red pandas, sea otters, chinese alligators/crocodiles, dolphins, and sea lions. My favorites were by far the giant pandas. They were so cute! (I wish that I could hug them :) ). The pandas were split between two buildings--one just for pandas, and the other also holding other animals in different places. Even though it was really hot outside, there was air conditioning in the buildings and they even managed to keep non-melted snow in one of the panda habitats! Incidentally, we also discovered that there is a type of goldfish called a Wenyu goldfish. Tomorrow we go to Shenzhen, and then to the competition in Shijiazhuang the next day. Hopefully we'll all do well! August 5, 2010 Our first full day in Hong Kong, most of us went to Ocean Park, nestled within Hong Kong's beautiful coastside hills. We rode a bunch of rides (Whee!) saw many many pandas (giant pandas, red pandas, stuffed animal pandas, glow-in-the-dark plastic pandas) and splashed down a water slide. Oh-- and there was this wacky show involving people diving into a pool and jumping on a trampoline. June 22, 2010 Over halfway through MOP! I just started getting used to the rhythm of things, and now it's nearly over. :( Good thing I'll be seeing most of the girls again soon! So, today's classes were lots of fun. First we had Polynomials with Po-Ru, where I got to brush up on interpolation. Then we did awesomely awesome constructions problems with Ian. Finally, in the afternoon, Carlos showed us some really cool angle-chasing problems. In fact, one of them is now my new favorite math problem! Other than that, some random notes: yesterday I got 0.9 style for my geometry write-up!!! My first 0.9 ever!!! Also, I recently realized that there are fireflies in Nebraska. Since California is devoid of fireflies, this was extra extra exciting. <3 Last but not least, I finally solved multiple problems on a test! Woohoo! June 21, 2010 Test 4 was today and it went really well. I always find myself looking forward to the tests and the interesting problems we can try to solve (and hopefully will solve.) After today there are only 8 full days left of MOP. I really don't want MOP to end. I have been having a great time so far and have loved reuniting with old friends and making new ones. The weather here has been pretty crazy. We have been having a huge number of thunderstorms, though no tornadoes yet. The other day it did hail, which was pretty surprising. The past few nights it has been easy to see the lightning without even looking out the window. I look forward to another week at MOP and I hope it doesn't end. June 18, 2010 Test 3 went acceptably well, I think. I was a failure, but many others did well. MOP is both everything and nothing I expected. Sure, I have a roommate, we do a lot of math, and the food is good - but I'd never have thought that I'd learn to play Hearts or that everyone would be so insane. Even the normal people go insane after a week or so. It's somewhat frightening - in a good way. Blue and Black have a mock IMO tomorrow - thank goodness I'm in Red. We have bijective proofs and more geometry, which should prove interesting. Tomorrow, we have number theory and then the DE Shaw conference/meeting before the test. June 14, 2010 Test 1 (aka Test 2) today. Another 4 hour test didn't seem so bad - it was my chance for redemption. :) MOP may be the only place where students actually decide to prolong such a long endeavor, as we continued discussing the problems well into dinner. It seems like the (math) problems never stop coming. We just got team contest 2 today, and everyone's rushing to do them. Fun stuff. Also fun is DBR's (an alumni MOPper's) singing Troupe - Jing Jing's and I can't stop baring Finite Simple Groups, a mathematical humor/romance song, everywhere. June 13, 2010 The team contest today didn't go as well as I'd hoped, since my room's teams assumed the position of sabotaging each other, compared to the cooperation experienced by Lynnelle's/Cynthia's room. Our room has the lowest scores. Today we also had a fire alarm at night. Everyone filed out while the sirens buzzed; fire trucks and police cars showed up at the residence hall. At first, we panicked because we couldn't find Andi (who was at the computer lab). Fortunately, it was a false alarm. I am sure looking forward to another exciting two weeks. June 12, 2010 I'm settling down quite nicely here. LOVE the ice cream machine and the toppings next to it. Played several games of hearts and lost a bunch of them. Four days of MOP classes has convinced me that college, and the rest of life, is going to be a complete, comparative breeze. Kids who complain about school haven't seen anything. I tried researching inequalities some more and then tried tackling the inequality practice problems. again, butchering them every which way (okay, more like factoring). No luck. Maybe I'll gain some insight during study session on Monday. Test 0 was surprisingly okay. I just need to keep my head steady. Tomorrow is Team Contest 1. No idea how that is going to turn out. Will hope for the best. P.S. For future MOPpers: MOP handbook has several inaccuracies, namely the descriptions of leisure time and activities. The former is non-existent; the latter is extremely primitive, such as cards. Luckily, this makes everything all the more educational.